This fully-adjustable Pulley Trainer system is made with the Highest Quality Materials. Made with 12 feet of 1/2" USA Made Rope, a large Ball-Bearing Pulley with an aluminum wheel, 2 Handles with built-in 1-1/2" wide Foot Loops, 33in Anchor Strap with built-in Door Anchor that lets you attach the trainer to almost any horizontal or vertical fixture, and 2 Carabiners for fast, easy set-up and take-down. Take your Training to the next level. The free movement of the CYCLONE Pulley Trainer challenges your core muscles more than Strap Trainers. Full-stretch rotational Exercises can be performed with the CYCLONE Pulley Trainer, no problem! 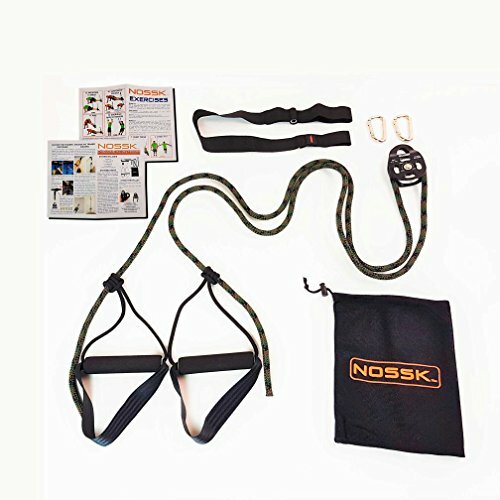 Train for a Spartan Race or for Cross Fit or simply make your own Home Gym with this NOSSK Pulley Bodyweight Trainer. No need for an Ab Roller or Free Weights or workout machine. The ingenious yet simple Prusik knot allows easy length adjustments - just slide the knot up/down the rope to shorten/lengthen the Trainer. The system comes with our "18 Exercise Full Body Quick Start Guide and a drawstring bag. Perfect for the active work-out enthusiast that wants more from their suspension gear. Environmentally friendly packaged (no shiny boxes). No DVDs to collect dust. Just what you need - First Class Equipment from a USA Company! 100% SATISFACTION GUARANTEED! VERSATILE - Perfect for indoor and outdoor use. Fully Adjustable, comes with an Anchor Strap with built-in Door Anchor that lets you attach it to almost any horizontal or vertical fixture such as tree branches, bars and rafters, poles or simply over the door. Easy length adjustments - just slide the knot up/down the rope to shorten/lengthen the Trainer. BEST QUALITY/BUILT TO LAST - The CYCLONE Pulley Trainer is made with the Highest Quality Materials. Made with 12 feet of 1/2" USA Made Rope, a large Ball-Bearing Pulley with an aluminum wheel, 2 Handles w/ built-in 1-1/2" wide Foot Loops, one 33in long Anchor Strap with built-in Door Anchor, 2 Carabiners, Install Instructions and a Double Sided 18 Exercise Full Body Quick Start Guide (to get you started right away). A Drawstring Bag to store your Trainer is also included. ENVIRONMENTALLY FRIENDLY - No wasted money for shiny boxes, no DVDs to collect dust. Just what you need - First Class Fitness Gear. 100% SATISFACTION GUARANTEE from NOSSK, Inc. - a California, USA company - 1 YEAR WARRANTY!